Due to the devastation of Hurrivane Harvey many games across the state of Texas were postponed, rescheduled or moved. This meant that band programs like UTSA, Houston and Lamar University would be unable to attend the games that they had been working all summer for. 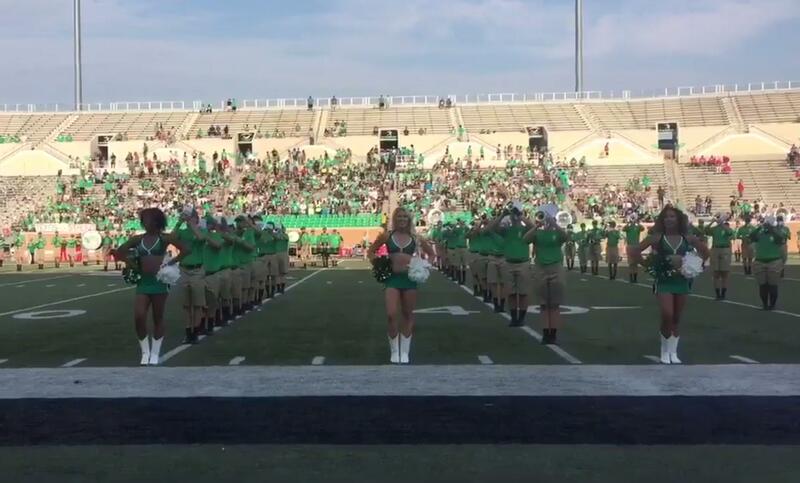 During pregame of the Lamar at North Texas game the UNT Green Brigade decided to help out their friends the Showcase of Southeast Texas, the Lamar Marching Band. The band was scheduled to attend the game, but due to Harvey they were unable to make it. The UNT band decided that they would step up and play the Lamar University Alma Mater in their place to help the football team and fans have a taste of home and support. We love our band family!